When I see a Tignanello in the store, looking all new and fabulous, I want to rescue it. That’s what happened in the case of this bag, perfect for someone who doesn’t want to change bags often. It’s got the zipper pouch with card slots and lots of other pockets. The long, adjustable strap means it can go shoulder or cross body. It’s a little smaller than I usually use, so if it’s for you, email me at 50favbags@gmail.com with bag #20. 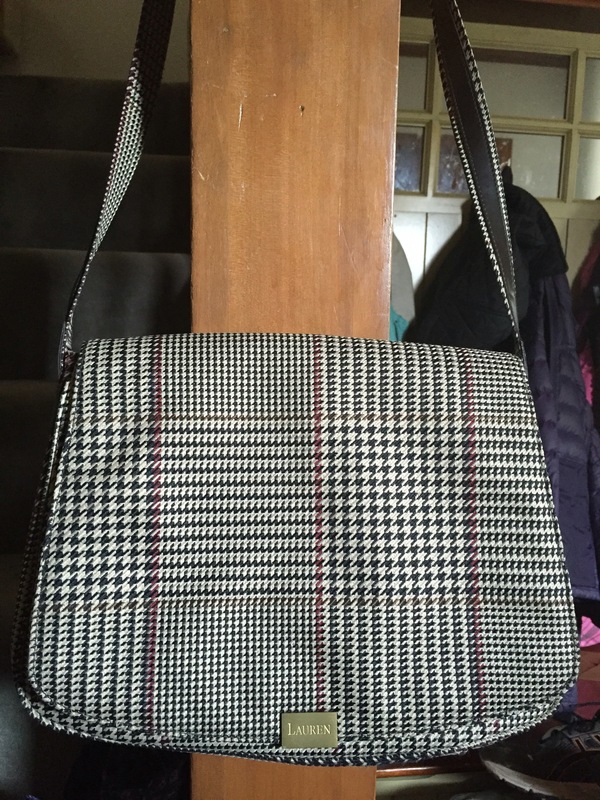 This entry was posted in 2016 Lent bag giveaway and tagged giveaway, Handbags and Purses, Leather, thrifting, tignanello on March 15, 2016 by miriamgmck. Here’s a bag I’ve had for at least 20 or so years. I got it at TJ Maxx when Nia was a baby and was my #1 shopping partner. David was in grad school, we had just left Ann Arbor (still crying inside), and we lived with my parents for 14 months. Needless to say I hung out in the streets with Nia a lot! I have enjoyed this simple bag; its strap is long enough to be a cross body for me, so you know it will be one for you. Beautiful dark brown leather, square, about the size of a big square iPad. Email me at 50favbags@gmail.com if you’re interested. Check out what’s left by viewing the post titles – if it doesn’t say taken it’s still available. Waiting for your bag from me? I’ve had a busy time of late – I’ll make deliveries on Sunday. This entry was posted in 2016 Lent bag giveaway and tagged brown, giveaway, Handbags and Purses, Leather, thrifting on March 11, 2016 by miriamgmck. This entry was posted in 2016 Lent bag giveaway and tagged giveaway, lucky brand, multicolored, suede trim, thrifting on March 4, 2016 by miriamgmck. Confession time… i’m uninspired with my bag giveaway. There doesn’t seem to be the same excitement as last year. Don’t ask me why i think a Lenten discipline should be exciting – but i’m just saying. A few days in a row with no one wanting the bags i was posting took the air out of my balloon. (What am i talking about? I don’t have a balloon. I should say what i really mean.) OK it made me sad. But – that’s part of life; and i’m pushing past those feelings because i have lots more great bags to give away, and those that don’t get claimed will go to good homes. Here’s an original Harvey’s seatbelt bag. I gave away a black one last year, and kept this one but have not used it once since… i have no clue. So it’s yours for the asking at 50favbags@gmail.com; include bag #15 in your email, and include your address. Peace! 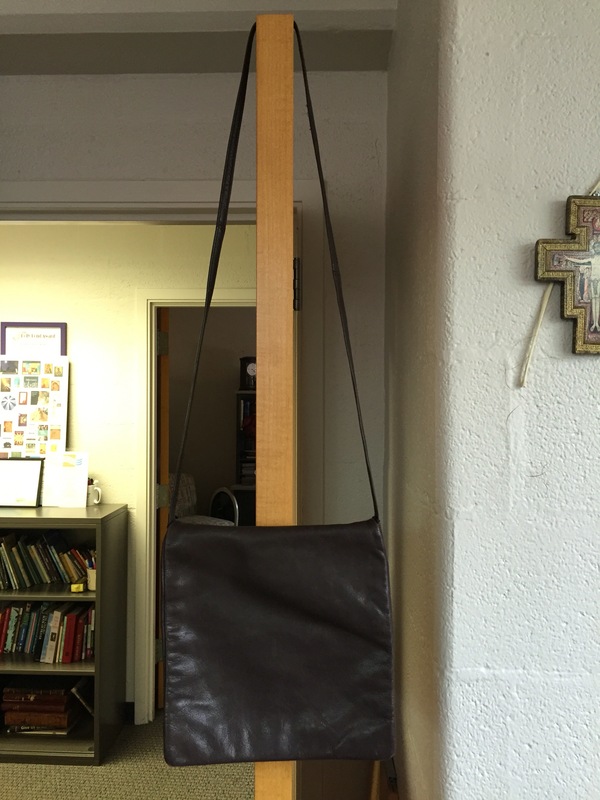 This entry was posted in 2016 Lent bag giveaway and tagged giveaway, goodwill, Harveys, red, seat belt bag, thrifting on March 4, 2016 by miriamgmck. I saw this purple shoulder bag at Valley Thrift and thought, no. No meant yes, and here we are. I couldn’t leave the purple purse in the store, Lent would be here eventually. Plus, Nia’s favorite color might still be purple. (that’s my 20yo daughter.) What can I tell you – when i put it against the rest of my collection, it had to go. My loss is your gain when it comes to purple bags. Email me at 50favbags@gmail.com if you’re interested. This entry was posted in 2016 Lent bag giveaway and tagged giveaway, Handbags and Purses, purple, thrifting, valley thrift on March 1, 2016 by miriamgmck. There wasn’t much going on at the St. Vincent de Paul, and then, I saw it. If ever a purse could remind me of my husband, this is it. He’s a total prep. New England prep. So I couldn’t resist the classic Lauren shoulder bag. Brown leather trim, clean inside, it’s like a bag made from a tie or pocket square. This bag will go with those riding boots and loafers! Brown with black and red herringbone checks. Email me at 50favbags@gmailcom if you like it. I have quite a few bags left; they must go. Free to a good home: bags 4, 9, 10, 11. Scroll down and see if anything looks good to you. Peace. This entry was posted in 2016 Lent bag giveaway and tagged fabric bag, giveaway, Handbags and Purses, Lauren, Ralph Lauren, thrifting on March 1, 2016 by miriamgmck. 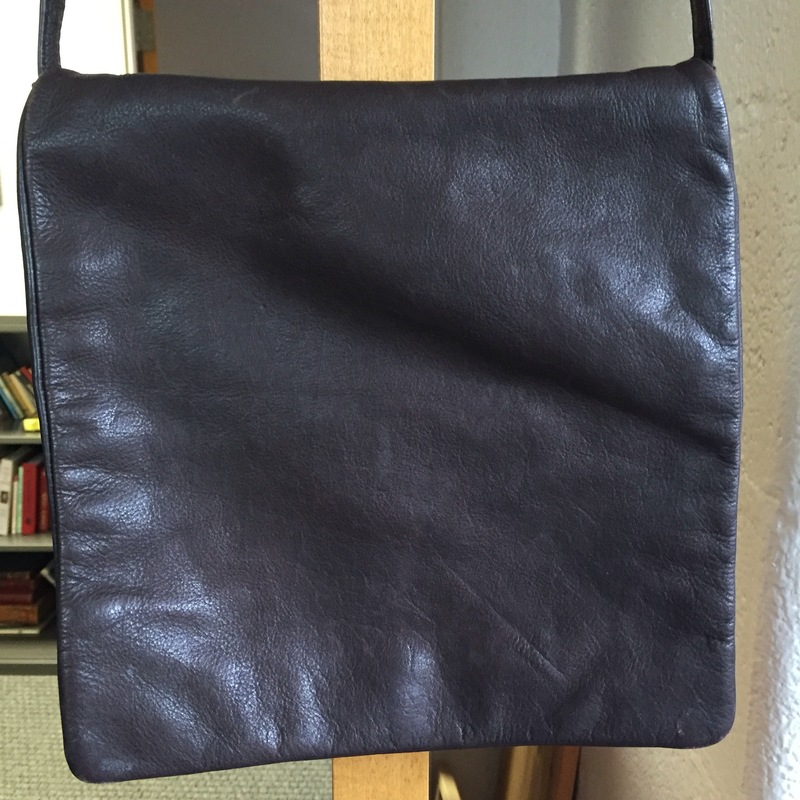 Tignanello again – this time a black pebbled leather shoulder bag. This is a beautiful bag with a front pocket, interior zipper pocket, and an adjustable strap. Silver details and feet (those things on the bottom of the bag that make it cooler) add a cool, modern touch. I got this one at the Este St. Vincent de Paul, and it was more than i would pay usually – but it was half off, so $10. Email me at 50favbags@gmail.com with bag #12 if you’re interested in this beauty. Taken by my bestest friend – thanks! 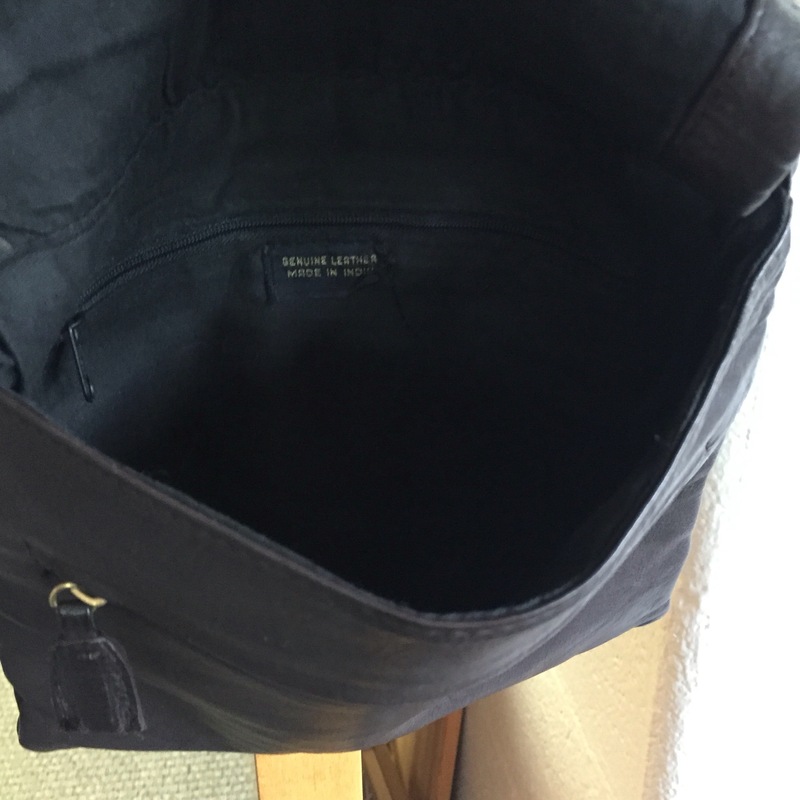 This entry was posted in 2016 Lent bag giveaway and tagged black, giveaway, Handbags and Purses, pebbled leather, st. vincent de paul, tignanello on February 24, 2016 by miriamgmck.